Vera is known for its thick, plant-like tail. Its tail is filled with a dense, hydrating fluid that is said to restore youth-like energy to the elderly. Vera's body easily dries out, which causes it to prefer damp dens to make its home. They usually emerge in the early morning in order to feed on the dew-soaked leaves of nearby trees before returning underground. While Vera is susceptible to heat its body is quite durable - it can even handle blows from Brutus with ease. When injured Vera will tense up and focus. The white spots on its tail will begin to glow, indicating that Vera is re-absorbing some of the healing nutrients within its tail, quickly restoring health and vitality. 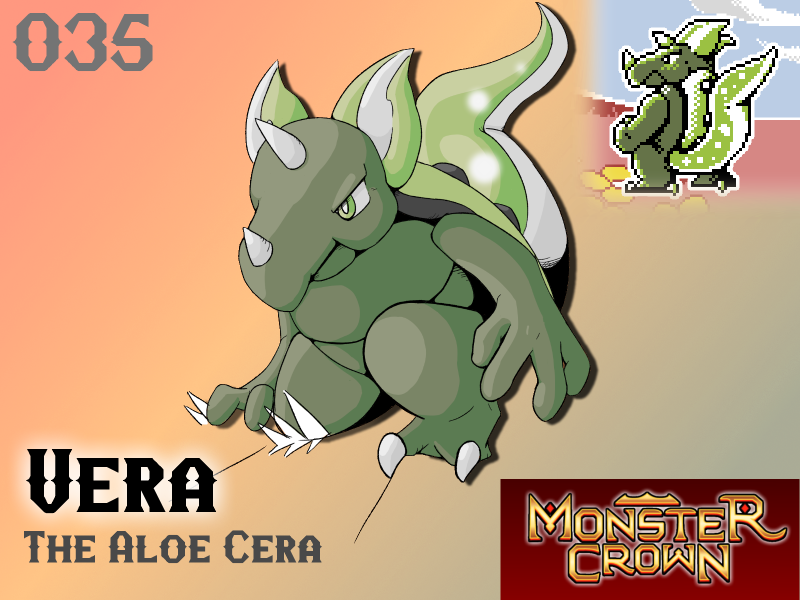 Vera's tail is so densely packed that it can endure very long battles, restoring HP at the cost of losing defensive ability. Will Vera make your team? I wonder if this dude can eventually be trained to learn how to apply his healing to Teammates...? Potential Combat Medic...?